This event has been postponed due to the weather. Please call 830-629-2226 for more information regarding this event. Our own Charro de Corazon, Gerardo Jerry Diaz and his team is Competing against the National Charro Team Champions from Colorado, Las Delicias Charro’s. The returning Champion from 15 years will be bringing his own team for a true Charro Competition right here in New Braunfels, Texas. We want to invite everyone out for a day of festivities at the Diaz Ranch to see this legendary art of Competition. The day will start with the Open Pasture Roping starting at 10AM followed by the Gran Charreada at 3PM. Live Mariachi’s and Banda Band bring the event to life. It’s an event you won’t want to miss. 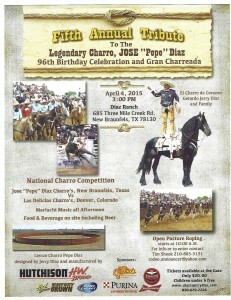 Come and witness what being a Lengendary Charro is all about. Special Appearances from Stacy Anderson Diaz and Nicholas Diaz and Family. Tickets available at the gate. Only $20 and children under 5 are free. This entry was posted on Wednesday, March 18th, 2015 at 2:23 pm	and is filed under News & Updates. You can follow any responses to this entry through the RSS 2.0 feed. Both comments and pings are currently closed.